After the restoration completed in 2011, the Villa is now in need of a conservative restoration of the plaster on the walls of the Courtyard. The need: The courtyard is affected by severe rising damp, which is causing it to fall off at the lower level, while higher up it is heavily marked. There are cracks caused by the settlement of the slope on which the villa is built. The entrance portal has moss and other surface deposits at the base. The conservation plan is to begin with cleaning all the surfaces, paying particular attention to the run-off, and to treat the lower wall with a suitable biocide. The loose plaster will be removed and the walls replastered with hydraulic lime mortar that will be finished with a fine plaster of the same colour and texture as the original. Finally, the surfaces will be given a protective lime wash of the same colour and texture. FAI UK is supporting this conservative restoration project for the year 2018. Vittorio Olcese, the last owner of the property, particularly wanted to donate Villa dei Vescovi to the community and after his death in 1999, his wife Maria Teresa, and son Pierpaolo, decided that FAI was the best option for assuring the future of their father’s beloved house. 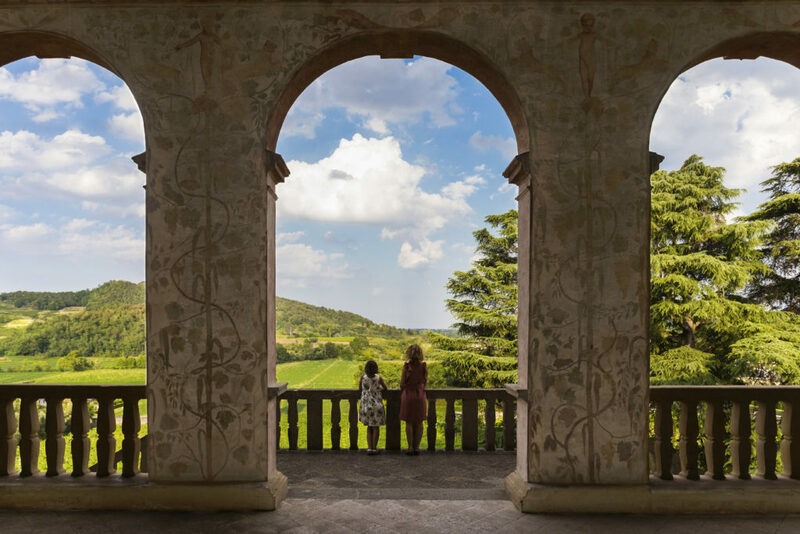 Before taking such an important step, Maria Teresa and Pierpaolo visited FAI properties open to the public in order to make sure that they were well restored and maintained, so that Villa dei Vescovi would be in good hands. 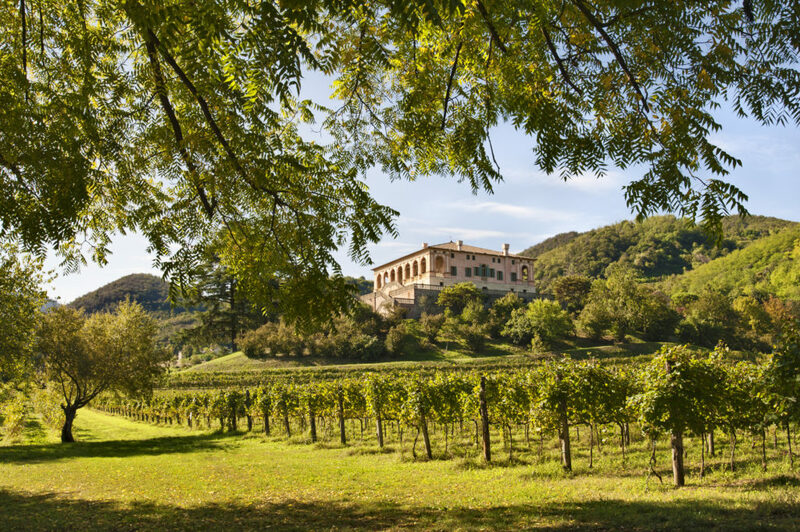 After a long and painful period of reflection—also given the economic value of the property they were giving away—Maria Teresa and Pierpaolo, in accordance with his sister Carolina, decided in 2005 to donate Villa dei Vescovi to FAI. Besides the villa, park and vineyards, the donation included antique furnishings that were inventoried, restored and replaced in 2011, the year in which the house was made ready for visitors after years. Villa dei Vescovi was built between 1535 and 1542 on a slope of the Euganean hills to provide the bishop of Padua with a sumptuous summer home. It is on the site of the parish of St Martin, which in 1077 already had a church with baptistery and cemetery, next to which there was a fortified episcopal palace that was an agricultural centre and seat of administrative justice. In the second half of the 15th century, humanist scholars identified Luvigliano as the Livianum, where the great Roman historian, Titus Livius, had his villa, and this played an important role in the conversion of this site into a residence for “villeggiatura”— retreat to the country, especially in the summer. In 1474, Iacopo Zeno, bishop of Padua, rebuilt the ancient church of St Martin, giving over more space to the episcopal residence. 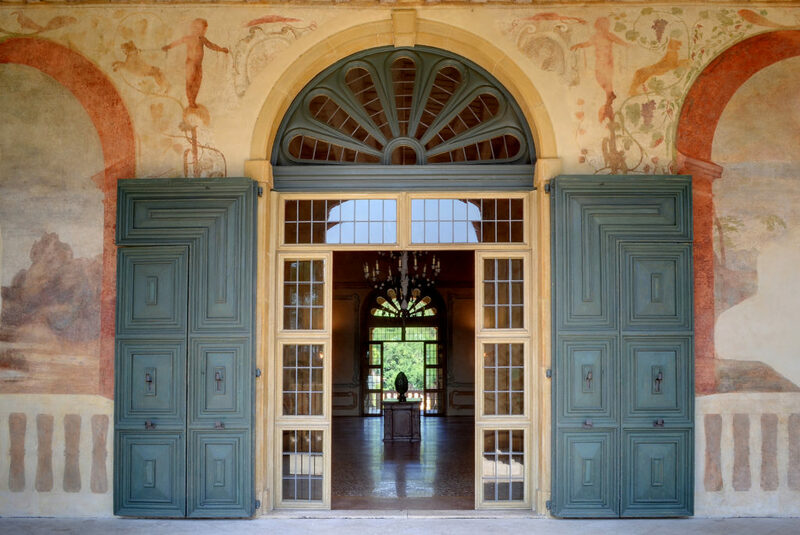 In 1553, after some years when it was abandoned, bishop Francesco Pisani employed the nobleman Alvise Cornaro to reconstruct the villa completely. Cornaro co-opted the painter-architect Giovanni Maria Falconetto and what we see now is really Falconetto’s design, with other architects involved subsequently. It is possible that Raphael’s most famous pupil, Giulio Romano, did some work here, while it is certain that the Amsterdam-born Mannerist painter, Lambert Sustris, is responsible for the frescoes. Falconetto’s assistant, Andrea da Valle, and Vincenzo Scamozzi, the Palladian architect and writer, also contributed to the villa, the latter creating the grotto. With World War II, the villa nearly ceased to be a home and was used as a refuge for evacuees, as a convent for Discalced Carmelites, and a retreat centre for young Catholics. 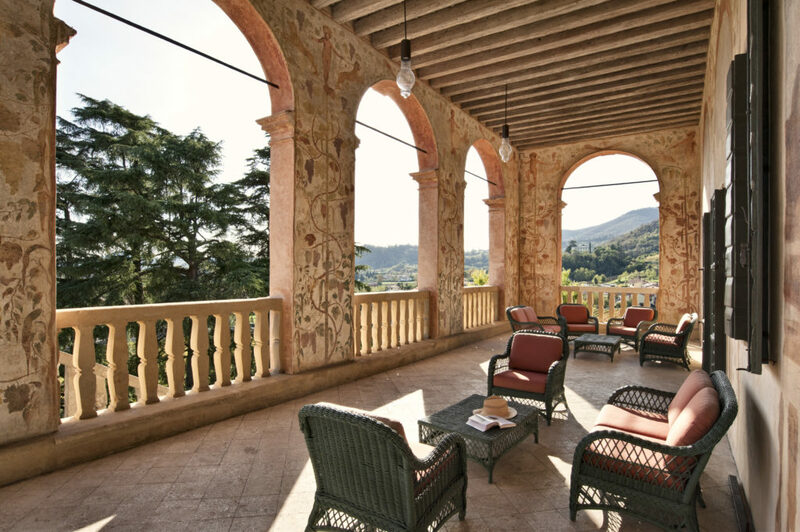 It was revived as a private residence in the Sixties when bishop Bortignon sold it to the Olcese family, who restored it and lived in it until they presented it to FAI – Fondo Ambiente Italiano in 2005. When it was handed over, the villa seemed to be in good order, but there were signs of structural problems. Indeed, emergency consolidation of the steps leading up to the terrace level and the portico had to be carried out at once. While the services were being modernised, evidence of a medieval settlement was found under the flooring, with a necropolis around the remains of a church dedicated to St Martin and a tower or octagonal baptistery. 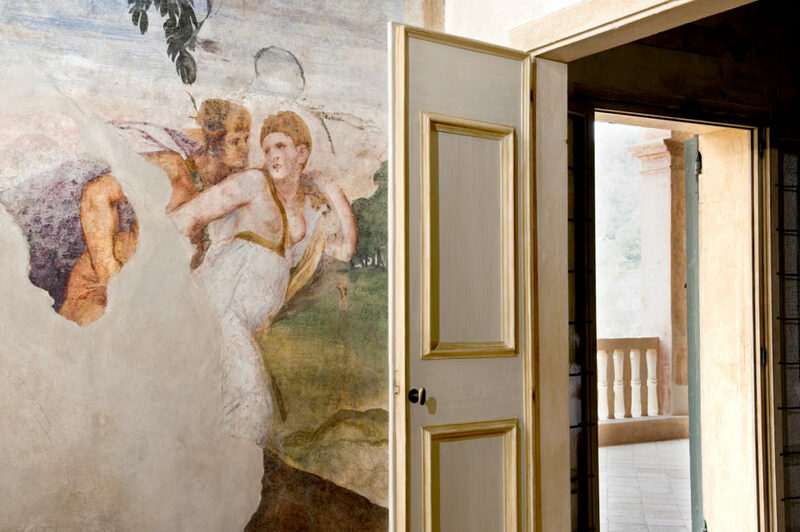 But this was only the first of the discoveries: by studying the evolution of the frescoes, it was possible to work out Giovanni Maria Falconetto’s original sequence for the rooms. The delicate job of conserving the frescoes was entrusted to Pinin Brambilla Barcilon, the restorer of Leonardo’s Last Supper.